Cathy and John just happened to be in the neighborhood and were able to make a slight detour off the freeway to stop in for a visit. They started their trek from British Columbia, and after a stop with family in Ontario, were headed to Illinois for a gig Wednesday night in Lake Villa, Illinois. Then they’re on to Wisonsin. If you are in the area, you won’t want to miss their performance. Cathy has FOUR quilting CDs out and they are all wonderful. She’s a quilter who writes songs about quilting. You’ll see yourself in her music and you’ll learn about incredible quilts of that past brought to life through Cathy’s lyrics and music. To stay sane on their long car trips Cathy is piecing a quilt top. 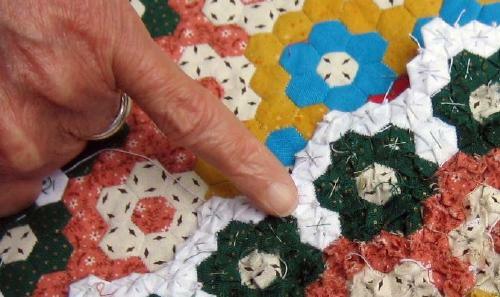 She’s working on a QUARTER INCH hexagon quilt that just blew me away. Check out the close-up photograph of her quilt below. The back is folded over onto the top of the quilt so you could see the teeny tiny seam allowances. That’s Cathy’s pinky finger as a guide to show you how small those little pieces are! Oh my goodness! You said, and I quote, “to stay sane on their long car trips…..” I can only question one’s sanity for making 1/4″ hexagons ! Ohmygosh – that is amazing! 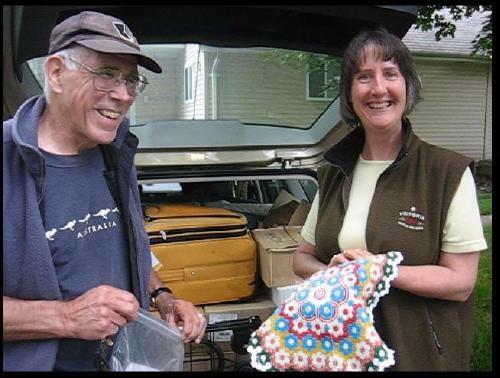 Cathy and John visited our Guild in Lake Arrowhead, CA a couple of years ago. They were terrific guests and entertainers; we laughed, and cried and sang to their songs. What a great time for all of us. If you can grab them as they pass by your area, it will be such a treat. They are wonderful people!